Three aging Klingon warriors come to the station in search of Curzon Dax so that they can fulfill an oath of vengeance alongside him. The three Klingons are all in TOS. Kor is in "Errand of Mercy," Koloth is in "The Trouble with Tribbles," and Kang is in "Day of the Dove." Bringing the actors who play them back for this episode couldn't have been an easy task, but it is definitely worth it. When Kor leaves the holosuite, the door opens with a TOS sound effect. Dax talking to a Klingon about how living is more attractive than death is appropriate coming from a person who lives multiple lifetimes. If there is a species who can claim to love life as much as the Trill, I'm not sure what it is. I write a lot about DS9 embracing moral ambiguity, but this episode is unambiguously dark. There is no positive moral to be taken from this one, and that's pretty friggin bold. As a character study on Dax, it's a much better story than "Playing God," as this tries to reconcile Jadzia and Curzon as two sides of the same character. It's also got that operatic feel that all good Klingon episodes have. 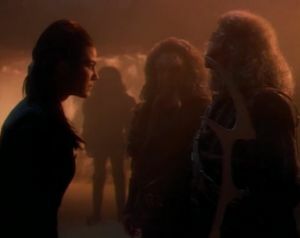 Kor is seen again on DS9 in "The Sword of Kahless" and "Once More Unto the Breach." This episode, and Dax's relationship with Klingons, paves the way for Worf's eventual arrival on DS9 in "Way of the Warrior."